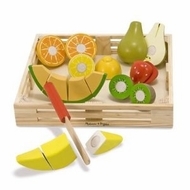 Wooden set features a wooden knife and seven pieces of "sliceable" fruit that can be cut into a total of 17 pieces. Food makes a fun "CRUNCH" sound when sliced. With so many pieces, it?s also a great way to introduce the concepts of part, whole and fractions. 18 pieces in all. Measurements: 9" x 7" x 2.7".